Is she taking advantage of my RN license? Yes, either talk to her about it, or when these reference seekers call, let them know it's been 10 years since you worked with her, and actually she's your cousin, so maybe you could give a personal reference. Funny things patients say ! 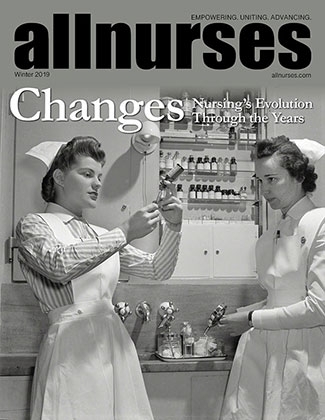 After this incident https://allnurses.com/nursing-humor-share/things-patients-have-52823-page150.html#post5020053 , the oncoming nurse and myself went down so I can show her where the IV line had "just come apart" (we knew he had done it on purpose) and she asked him "Why did you do that?" He answered "I guess I just wanted some excitement." Things Patients Have Taught Me NOT To Do. Do not "mess with", "play with", or even "touch" your IV line if they seem to "come apart by themselves" (like it did a couple of days before, amazingly right above a pressure hub, again, making your chemo infused blood spill all over the floor). Especially when your nurse just hung chemotherapy. Especially when that chemotherapy is a vesicant. Especially RIGHT AT SHIFT CHANGE. Well I'd say it's a typo and they meant to say drops/minute, but maybe there's something I've missed? You've got micro drip tubing there, and it's drip factor is 60 gtt/min. I did find a calculation for micro drops, but basically you would just move the decimal over, what, 6 places? So you'ld get some crazy number like 18,000,000 micro drips/min. Which is just ridiculous and not even applicable to nursing care. What would that number even mean? How would you apply it in practice? This is homework right? Ask your instructor if they mean drops/min or micro drops/minute. And does it really say microdrops/min? is that some new conversion I don't know? You can't calculate a microdrop can you? I'm seriously giggling now, mcgtt? It sounds like something you could order at McDonald's. At least it's not apothocary conversion. Those REALLY made me irritated and luckily we only have like 2 MDs who still order that way. ok i got 49 kg x 6 mcg/kg/min = 294 mcg/min 294 mcg/min = 0.294 mg/min 0.294 mg/min = 17.6 mg/hr 17.6 mg/hr = 17.6 ml/hr then: (17.6 ml x 60 gtt/min)/60 min = 17.6 gtt/min and i'd round it up to 18 gtt/min. Where did the 0.6 mg come from? Ack!! Now I'm gonna start over from the beginning. ROFL now we're all confused. You're fixing it to I'll just keep going. I'm still trying to figure out where the 4.2 came from. You got the 294 mcg/min, how did you get 4.2 mg/hr? 294 mcg/min = 0.294 mg/min right? Then 0.294 mcg x 60 = 17.6 mg/hr No matter which way I do it, I can't get 4.2 anywhere. Oh well, I always hated these types of math problems. They take so much time to break it down. It's funny how now in the field, I can convert on the fly and not even think twice about it, though I usually have someone check my math if it gets too complicated. Heparin and insulin drips make my brain hurt. Convert the mcg/min into mg /min. Then convert the mg/min to mg/hr. Since it's 250 mg/250ml, your mg/hr will = ml /hr. You've already calculated the mcg/kg/min and I got the same. I got a completely different mg/hr than you though. 49 kg X 6 = amount of mcg/min pt should receive. That amount converted to mg x 60 = mg/hr 250mg/250ml x the amount of mg/1 hr = # of ml/hr (and I didn't get 4.2) For the drip factor (amount of solution X drop factor)/time in minutes = drops per minute So you take your calculation from above which will give you ml/hr, that's the (amount of solution x 60gtt/hr)/60 minutes = drops per minute. Someone check my math. That one was hard but mostly because of the number of steps. You need to take it step by step, converting as you go to the final calculations, and it will be easiler if you calculate ml/hr then the gtt/min. I stuck myself with a clean butterfly once, then almost exposed my patient. The cap wouldn't come off and when I pulled it off with force, it must have stuck me, and I didn't even feel it (those butterflies are what 28 gauge? later it felt like I had gotten a splinter). It wasn't until I was leaning over the patient's arm about to stick her that I saw blood in the thumb of my glove. I just stood up and said "I think I should get a different needle. I just don't trust this one." Now that would've been an interesting incident report. Just piggy back one foley bag into another. Take off the "foley" part of the second bag and put the spout from the first into the rubber tubing from the second. Then unclamp the first bag and it will drain into the second. When you hang them below the bed, make sure the upper one is hung a little above the lower. No I didn't prepare for the HESI. No more than I did for any class test. I just considered it another test for each class, not something extra. You can easily get overwhelmed if you act as if it's a seperate course of study, because it's not, it's just a different form of test for the same classes you will be taking. I didn't do any studying before school started. I did buy my books and printed off stuff once it became avilable online for the classes. I saved that e-mail for a while, but it was on my old computer, so I don't have it anymore. But I remember first opening the e-mail and thinking at first it was that I hadn't filled something out right or they needed more information. I guess I expected it to have something more... substantial to it. The subject line didn't say "You are accepted" or anything memorable. But I do remember clearly the list of stuff it had that I needed to complete in a scant 2 weeks before the date that I had to go to the school to present proof I had done those things and be registered. Maybe I had overlooked the e-mail at first or hadn't checked in a while, but it felt like I wasn't given much time. I had to get my immunization records together which for me included a couple of shots and titers, a TB test, a physical, get CPR certified, make the appointment for and get drug tested, and do the background check. I already had proof of health insurance, so I didn't need to deal with that, but others had to enroll in the school insurance program. Because I was working at the time, I had to take a couple of days off to get it all done, and even then I worried the drug test or background check wouldn't get completed in time. Just a recommendation if you get accepted. For your clinicals you will have to present proof of having been "oriented" to the hospital stuff on safety, HIPAA, etc. You'll watch a few of videos and receive a little card that is good for a year. For your first one, you'll do it on orientation day. Make a packet with copies of that card, proof of immunizations and TB test, your health insurance, and your CPR card. You will have to present it to your clinical instructors at the beginning of each clinical. Some clinical instructors will just look at them and hand them back once they've checked off that you have them, others will keep them on file, so just make copies for each class and put them in an envelope, and keep the originals someplace safe. You'll also have to sign an indemnification agreement before each clinical, so print it off, sign it, and put it with your packet before each clinical starts. It will save you shuffling through paperwork on that first clinical day, and your instructor will appreciate it. Send me a PM if you have any other questions. I don't mind at all helping. I enjoyed my time in nursing school much more than I did any other college classes I took in the many other fields I studied, and I have a few other tips that will save you much time and grief from instructors when you get there. FAILED NCLEX 5 Times please pleasae HELP ME!!! Well, what does the performance report state you need to work on? What areas did you fall below the standard on?